We Provide the robust, reliable and most effective Magento shopping cart solutions. HK Technolabs is known for its perfection and edge-cutting solution that we produce incorporating the latest technologies for your online eCommerce store. Magento is a widely acclaimed CMS for eCommerce development and aligns your business with the new era of developments. 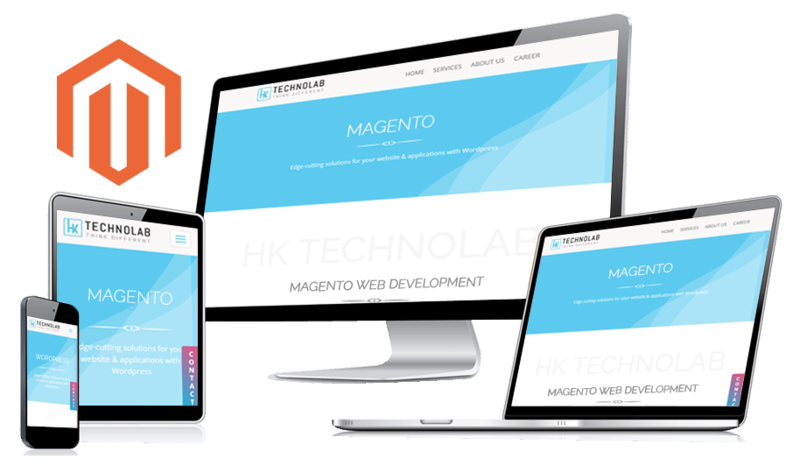 HK Technolabs is known for the rapid and effective Magento development, from design to complete build we look up the project at every step. Our business analyst does a thorough research of the market and then arrive at a solution to help you create a fully functional and adaptable website. We curate the best of technology keeping in mind the audiences and their requirements. Our custom Magento Development Solution services help you transform your online eCommerce store into a top listed eCommerce enterprise. Integrate your Magento online store with the Magento extensions. We also help you develop your very own custom Magento extensions. A theme is the front face of your store. Our design professionals create the uniques & professional Magento Theme design for your website. We provide Shopping cart eCommerce development solution to help you sell online efficiently with your own eCommerce store worldwide. You will never experience sluggishness in Magento site speed. We let you optimize your Magento Site for better speed and performance. Optimize your eCommerce website with easy order management and workflow with simple extensions. Control and manage your order easy from the manager. We work thoroughly with all the enterprise models of Magento aiming to provide robust and flexible eCommerce solutions. Get the door open to new eCOmmerce frontier with automated product import, order placement and more with Ingram Micro Integration. We let you install configure and activate a module without worrying about the code. We help you develop custom Magento Module. With every new versions we are an expert. Install updates into your Magento store with the help of our experts and get smooth functionality in to eCommerce store.